Description According to Christian tradition, after meeting Christ, Mary Magdalene repented of her former sinful ways. With her ivory skin and long golden hair, the beautiful Magdalene turns her gaze toward heaven. Her cross and the skull make it clear she is meditating on the brevity of life and the salvation made possible by Christ's death. Reni created an idealized, as well as classical style influenced by ancient sculpture and by the Renaissance artist Raphael (1483-1520). 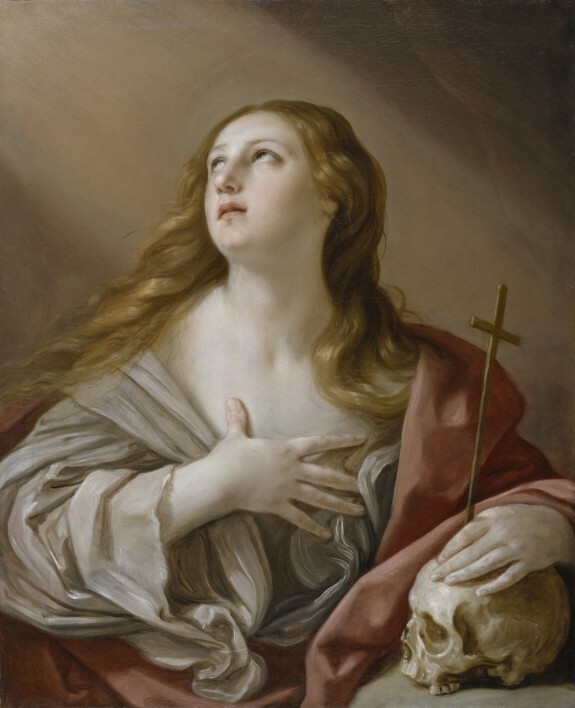 This influence is visible in the Magdalene's rounded, even features, painted so smoothly that the strokes seem to disappear, in contrast with the broad, energetic strokes used for the drapery, more typical of 17th-century painting. Images of female saints sometimes depicted in a seductive manner, were very popular with some artists and patrons in the 17th century, and Reni painted many versions of this composition. The Divine Guido: The Paintings of Guido Reni. Pinacoteca Nazionale di Bologna, 40126 Bologna; Los Angeles County Museum of Art, Los Angeles. 1988-1989. Saints and Sinners: Caravaggio and the Baroque Image. McMullen Museum of Art, Boston College, Chestnut Hill. 1999. Provenance Cardinal Antonio Barberini [? ], Rome, by 1671; Prince Maffeo Barberini [? ], after 1672; Cardinal Flavio Chigi, Rome, by 1692; Chigi family, Rome, by descent; Neville; Sale, Christie's, London, March 2, 1804, no. 60; George, 7th Baron Kinnaird (d. 1805), Rossie Priory, Inchture, Scotland, by purchase; Charles, 8th Baron Kinnaird (d. 1826), by descent; Sale, Phillips, London, May 21, 1811, no. 5, unsold; Sale, Sotheby's, London, February 26, 1812, lot 77, unsold; 12th Baron Kinnaird, by descent; Sale, Christie's, London, June 21, 1946, no. 31; Private collection, Netherlands; Sale, B. V. Vendu Notarishuis, Rotterdam, February 26, 1987, no. 75; Piero Corsini, Inc., New York, 1987; Walters Art Museum, 1987, by purchase.